 A dozen tales of the American Irish--sharp-tongued, silly, and so whimsical they leave nary a memory--by the author of Available Light (not reviewed). 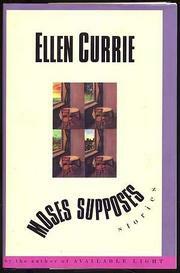 The title is a tip-off: Currie's characters often drift off into meaningless wordplay just when you'd think they'd want to pay closest attention to what's going on. In the title story, a young couple indulges in rhyming games as an unexpected pregnancy threatens to tear their marriage apart; in ``The Solution to Canned Peas,'' an estranged middle-aged couple exchanges barbs in the kitchen even as the rift between them proves too deep to cross; in ``Slim Young Woman in No Distress,'' a desperately ill woman teases her young son, preferring not to face the fact that she'll soon lose him; and in ``Exit Interview,'' an advertising executive wittily reviews a client meeting with his frighteningly youthful assistant and lover while fending off thoughts of his dying wife. Tragedy and a morbid sense of wonder lie just beneath the surface of all the stories in this collection, though it's often difficult to spot these elements behind the veil of incessant banter. True as it is that in this world most folks will take denial if it's offered to them, one longs for a bit more passion and substantially fewer words. This is particularly the case in ``Yesterday's Lilies, Dollar A Stem. An Epsilon,'' in which the son of an Irish caretaker couple learns that his mother may have tried to kill herself and rolls around, laughing, with the family dog; in ``Old Hag, You Have Killed Me,'' whose protagonists bicker over hair color while their father dies in the hospital; and in ``Whatever You Say, Say Nothing,'' in which a woman who's just given birth amuses herself with baiting her mother even as her husband leaves her for another man. Light comedy; sometimes charming, but rarely involving.